After Labor Day, people across the country pack up their towels, stash their unfinished beach reading, and stow their beach chairs for the winter ahead. But what they don’t realize is that fall and winter are actually the best times of year to visit many beaches around the country. Smaller crowds, empty swaths of sand, and lower prices on lodging make beach vacations even more appealing in September and beyond. These 10 beaches are some of the best to visit in the off-season. 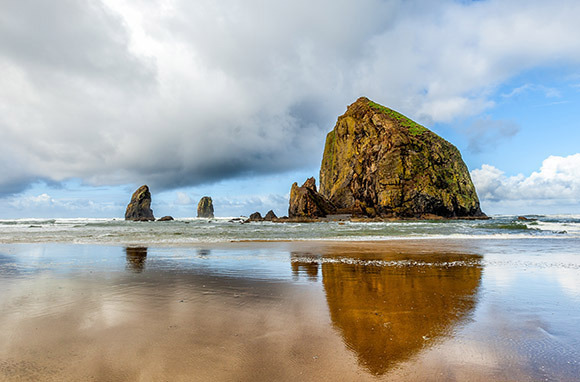 The sea stacks at Cannon Beach distinguish it as quintessential Oregon coastline (yes, you probably recognize it from The Goonies). In calm weather, you can walk right up to the famed Haystack Rock and explore its tide pools with colorful sea stars and green anemone. 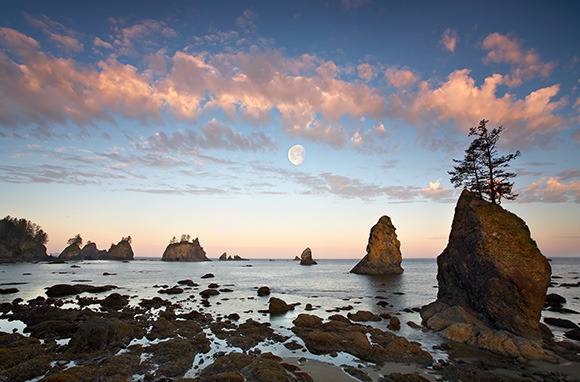 Bring blankets and a bottle of wine so you can cozy up into the evening with a twilight bonfire and watch some of the year's most incredible sunsets (there's no rule against alcohol along the Oregon coastline). It's a year-round bird-watching location, but the wildlife really comes out when the crowds disperse. Visit neighboring Ecola State Park and watch for elk and migrating grey whales off-shore. Plus, Dungeness Crab season begins in mid-December, so you'll reap the benefits at local eateries. Storm chasers will love the unpredictable weather that can bring crashing waves, best enjoyed from an oceanfront hotel with dramatically reduced rates. Wealthy New Yorkers and celebrities flock to the eastern end of Long Island, past the Hamptons, for a little R&R. But post-Labor Day in Montauk is when the real R&R begins. After all, the point is to get away from Manhattan's traffic jams, right? Surfers come to Ditch Plains for its consistent reef break that's ideal for long-boarders. You'll need a wetsuit, but then again, many surfers here wear a wetsuit year-round. Nearby Montauk Point Lighthouse is a worthy photo-op, particularly at sunset. While many of the town's seasonal shops and restaurants may be closed, the ones that are still open won't have long lines or require a reservation. Anywhere on Cape Cod and the islands is quieter in the off-season (thank goodness for less Route 6 traffic). But the best part about going to Martha's Vineyard in the fall is you actually have a shot of getting your car on the ferry without reserving a year in advance. And with less cars congesting the island (and out-of-towners driving like maniacs around the narrow roads), it's a bicyclist's paradise. Whether you're cycling or driving, Moshup Beach (also known as Aquinnah Public Beach) is the island's best. You won't have to fight for parking or pay fees in the off-season, and the empty beach is the perfect spot for strolling, picnicking, or (if you're lucky) spotting seals. Plus, the nudists that tend to stake claim to the beach along the dramatic, multi-colored cliffs are bundled up for the winter. Summer is peak season for the classic road trip down Highway 1, following the California coast. But the Pacific Coast Highway, particularly the portions through Big Sur, are an ideal getaway in the off-season when you have less of a chance of someone honking at you to go faster as you ogle the dramatic cliffs and pay close attention to the winding turns. Frequent visitors to the area know that the sunsets leading up to and just after the winter solstice offer some of the most dramatic lighting, particularly the glow that's cast through Keyhole Arch along Pfeiffer Beach. If you have no interest fighting for space with pro and amateur photographers, you can still catch vivid sunsets against the purple sands, not to mention whale watching at its peak from December through April. 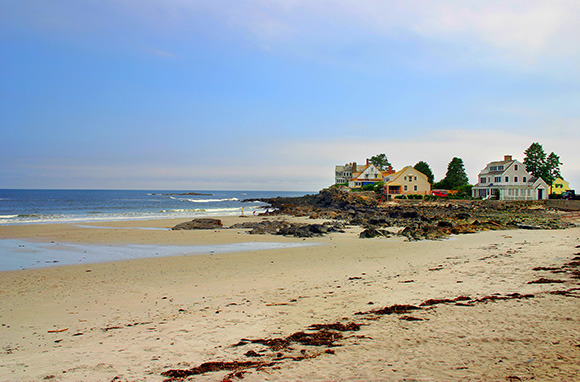 You won't have trouble finding a place to lay your beach blanket and cozy up to a carafe of coffee at Kennebunk Beach. The deserted string of beaches—some sandy, some rocky—make for a different take on autumn leaf peeping or a serene winter stroll. During the quieter times of year, you'll find dog owners letting their pets scamper through the sand while they comb the beach for sand dollars. A sidewalk runs from Gooch's Beach to just past Lord's Point for a 4.2-mile round trip stroll. If there's snow on the ground, nearby countryside offers an idyllic setting for cross-country skiing, snowshoeing, or sledding. If you can't stand the thought of the cold, this is your beach. 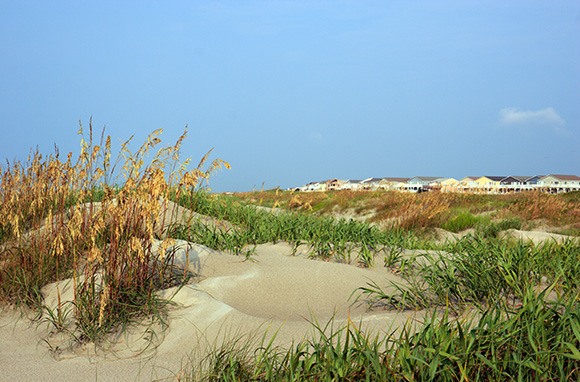 Just north of bustling Myrtle Beach and south of the Outer Banks sits Sunset Beach. The town and the adjoining Bird Island coastal reserve encompass a barrier island. Walking along Sunset Beach (it's made for long walks) you'll eventually hit signs notifying you that you've reached the reserve. Consisting of nearly 1,500 acres, the reserve protects towering dunes, salt marshes, and tidal creeks. Walk far enough, and you may stumble across the "Kindred Spirit" mailbox. Inside is a notebook where people have continued to share their thoughts for years. And of course, with a name like sunset beach, you can expect golden rays to put on a show at the end of the day. Washington is known for its perfect weather in July and August. But what locals know is you just don't make your plans around the weather, especially in the winter. The off-season just intensifies the theatrics of Shi Shi (pronounced shy-shy) Beach, part of Olympic National Park. The hike to the beach, about two miles each way from the day-use Makah Shi Shi trailhead, almost inevitably involves a bit of slogging through mud (choose footwear wisely) and ends with a descent down a bluff (an anchored rope is there for guidance) to the sands below. Tide pools, caves, and ocean-battered logs make this beach otherworldly. While you can camp on the beach at Shi Shi, warm beds and arguably just-as-beautiful scenery await at the oceanfront Kalaloch Lodge. Though it's a couple hours south by car, the lodge's seclusion and direct beach access (and distance from the Twilight-inspired downtown Forks) make it a worthwhile stop. Note: The Makah Shi Shi trailhead is on reservation lands. Purchase a $10 permit in Neah Bay before setting off. Several locations sell them, but Makah Mini Mart is open the latest. Okay, Mackinac Island isn't a specific beach, but, being an island, you can explore the rocky beaches around the entire coast of this 3.8-square-mile island. Foliage season is breathtaking and ideal for bicycling (especially since cars aren't allowed). More than 80 percent of the island is part of Mackinac Island State Park, home to historical landmarks, hiking, and biking trails. But for those that can weather winter, it's a whole different scene. Wintertime in Mackinac brings an even slower pace (if that's possible) that's made for relaxing. The entire island is a national historic landmark with only about 500 permanent residents. But these hearty residents host activities including a Christmas Bazaar, winter festival, and chili cook-off. Most residents cross-country ski or snowshoe downtown to staples like Doud's, the country's oldest family-owned grocery store. The Jersey Shore is absolutely nothing like its stereotypes come winter. In the off season, Cove Beach brings out birders and surf fishers who try to score striped bass, among other catches. Catch a glimpse of Cape May Lighthouse on clear days (or head the short distance to the lighthouse to climb the 199 steps to the top). 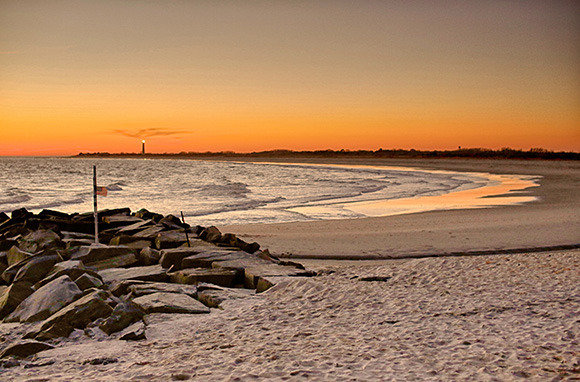 Cape May beach tags are not required after Labor Day, and, come December, the town comes alive in Dickensian splendor. The Mid-Atlantic Center for the Arts hosts several Christmas events, including Victorian house tours and trolley rides. Post-holidays, solitude is the biggest draw. And if the weather ever gets too cold, just pop into Tommy's Folly Coffee Shop for an unbeatable cup of cocoa. North of the hustle and bustle of South Padre Island—and more than a three-hour drive away—sits 70 miles of protected coastline, dunes, prairies, and wind tidal flats. The Padre Island National Seashore is a quieter alternative, particularly during spring break, to its southern neighbor. It's the longest stretch of undeveloped barrier island in the world. There you'll find Malaquite Beach on the Gulf of Mexico. 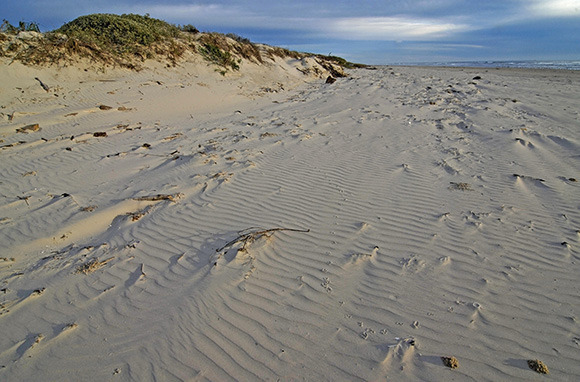 Closed to vehicles and pets, it's the most undisturbed portion of the seashore, ideal for walking along the dunes or kicking back with a good book on the powder-soft sands. Kate Sitarz also writes for Zipcar while eating, drinking, and hiking her way through the world. Follow her nomadic life on Instagram @katesitarz and Twitter @katesitarz.